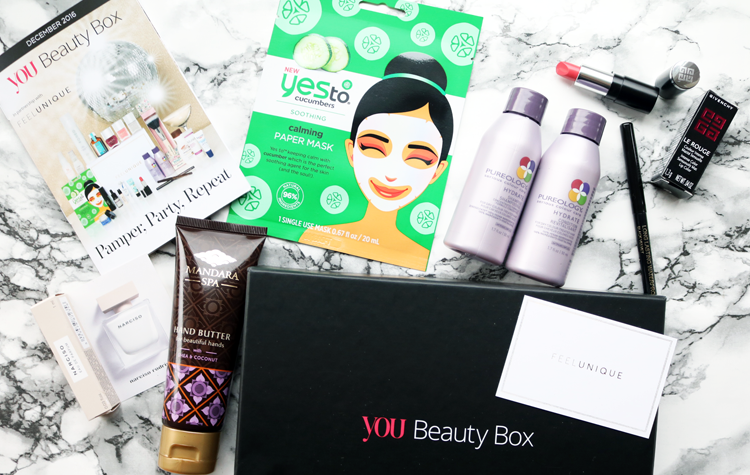 December's You Beauty box has arrived, and I cheekily decided to upgrade to the Gold membership thanks to an awesome shortlist of products being featured this month. December's You Beauty box is a special collaboration with Feel Unique and is themed around Christmas parties and pampering. I was spoilt for choice when I saw the shortlist and promptly ordered my box as I anticipated that a few products may sell out (and I was right - several went out of stock pretty fast!). 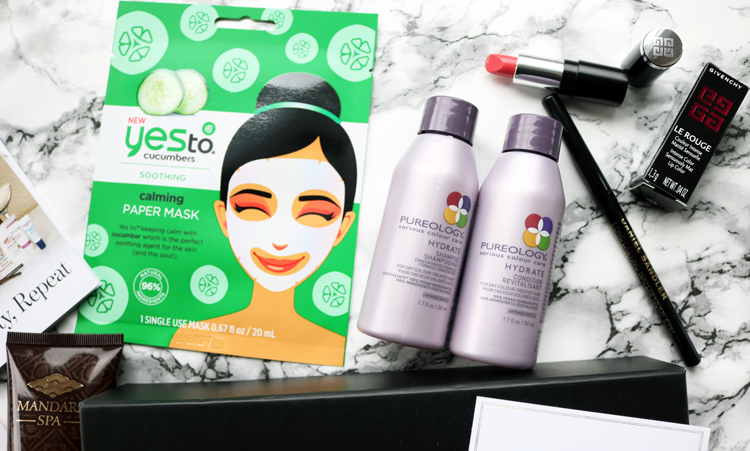 Yes To Cucumbers Soothing Calming Paper Mask (1 mask) - I was a little hesitant about getting this as it's got some really mixed reviews online, however, a PR rep for Yes To told me that it's been reformulated recently hence the 'new' on the packet, so I decided to give it a go. I've liked all of the other Yes To products that I've used in the past, and I'm addicted to sheet masks in general, so I have my fingers crossed that it'll be good. If you've tried this already, please let me know how you got on! Pureology Hydrate Shampoo & Conditioner (50ml each) - One of my friends' uses this range and I've been meaning to try it myself for a while now. Free from sulphates and vegan-friendly, it deeply hydrates dry hair and enhances colour radiance. These are really good sizes to travel with too. Givenchy Le Rouge Lipstick (1.3g) - I'm a sucker for miniature makeup, especially lipsticks, so of course, I had to have this. It's in the shade 202 Rose Dressing, a pretty semi-matte coral pink. Great for handbags and evening clutches. Daniel Sandler Long Lasting Waterproof Eyeliner in Black Velvet (full size - RRP £9.25) - I've literally just finished up one of these the other day and absolutely had to bag myself a replacement as it's one of my HG eyeliners. I've used these for years and dubbed it one of the best eyeliner 'all rounders' in a blog post earlier this year (read it here). Thrilled to have managed to pick it up in a beauty box as it's something that I would happily pay full price for! This month's freebies were Narcisco Rodriguez Narcisco Eau de Parfum (1ml) and a 15% off Feel Unique voucher which you can use on any of the brands featured in December's box. Gold members also received an additional extra freebie which was a full-size Mandara Spa Hand Butter.